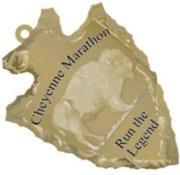 The Cheyenne Marathon "Run the Legend" route is being re-designed. Relay Start Time: 6:30 a.m.
Half Marathon Start Time: 6:30 a.m.
10k Start Time: 9:00 a.m. The route is very close to final. This constitutes the first half of our marathon and it must be precisely 13.1 miles. It is close but yet to be certified. 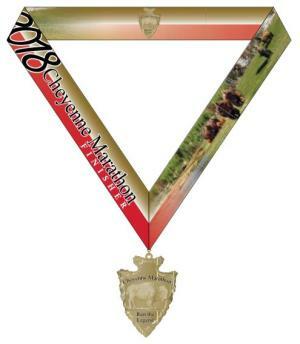 The Cheyenne Marathon “Run the Legend” Virtual Race is a great opportunity for those of you that are not able to travel but still want to participate. WHAT IS A VIRTUAL RACE? A virtual race is a race that can be run (or walked) from any location you choose. You can run, jog, or walk on the road, on the trail, on the treadmill, at the gym or on the track (or even at another race). You get to run your own race, at your own pace, and time it yourself. Run on your own, or with friends! Your medal will be shipped directly to you. 2. Shirts, bibs and medals will be shipped to the address you enter on this registration page for an added $15.00 shipping fee. 3. No cancellations or refunds. Virtual runners are not able to “place”. Race packet pickup will be on Saturday, September 14, at the Depot Plaza . The Depot Plaza (also the finish line for all events) is located at 121 W. 15th Street. Registration closes at Noon, Friday, September 13th 2019. No registrations will be accepted after that time (no day of registration). In addition, there are 2 free City Garages and several parking lots near the Depot Plaza (finish line). Funds raised go to the Cheyenne Kiwanis Club community budget to be used to fund various community based programs and requests.